Last Sunday was Greek Easter and as always my family gathered for the day and dinner. The weather was beautiful. We grilled our leg of lamb outside. 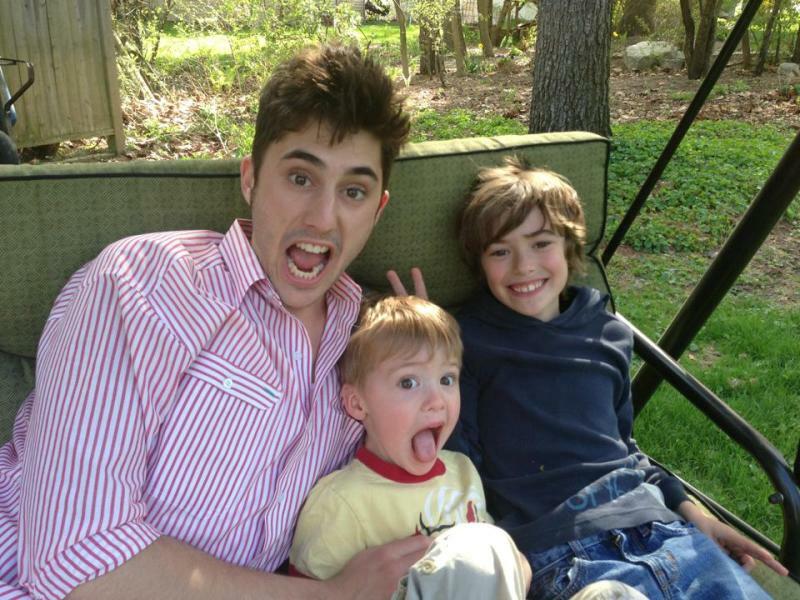 The boys ran around, played in the yard on the green grass and on my green swing. They were having too much fun for a serious photo. I added one new recipe to my menu this Easter. I made Greek Easter soup, Magiritsa. This recipe takes me back to fond memories of my Yiayia Yeoryia (Georgia). She made it every Easter with the offal (organ meat) from the spring lamb. May her memory be eternal. Per Wikipedia: “Magiritsa is a Greek soup made from lamb offal, associated with the Easter tradition of the Greek Orthodox Church. Accordingly, Greek-Americans and Greek-Canadians sometimes call it “Easter soup”. Don’t be confused by the different phonetic spellings of magiritsa/magheritsa. If you Google either you’ll get at least 1,000 results. I decided to make a simpler version and used Peter Minaki’s Neo-Magheritsa recipe. I boiled lamb trimmings from the Eastern Market butcher shop where we purchased our leg of lamb. 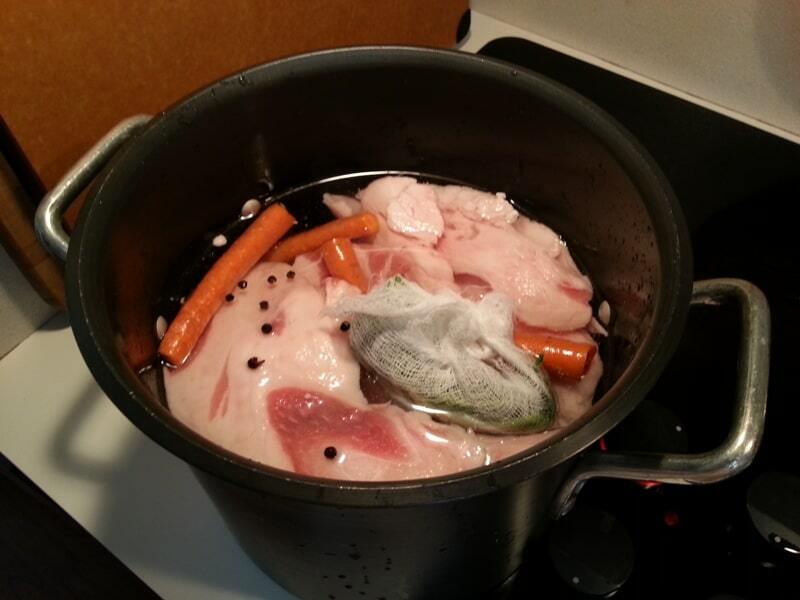 I added carrots, leeks, salt, peppercorns and a bouquet garni of parsley stems. I did this on Saturday, the day before Easter. 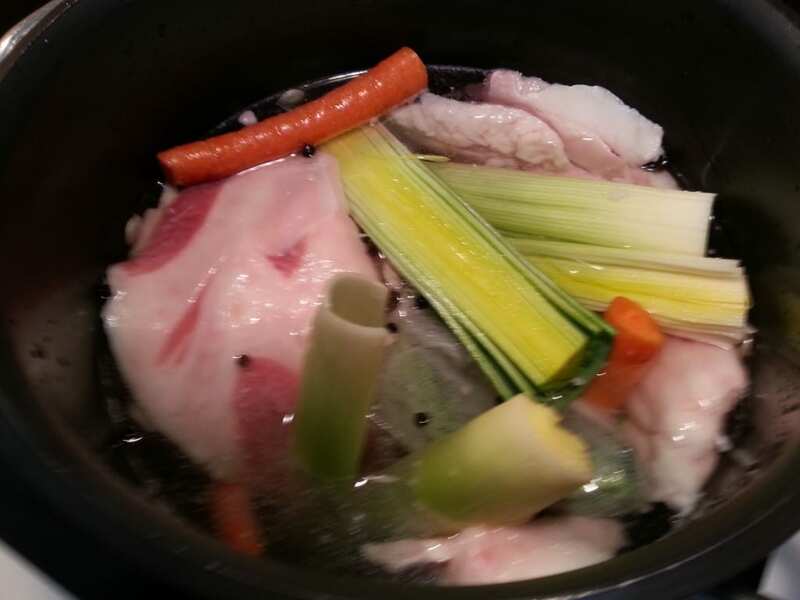 After the mixture came to a rigorous boil and simmered, I drained the broth and refrigerated it. On Sunday morning I skimmed off all the fat that had floated to the top. 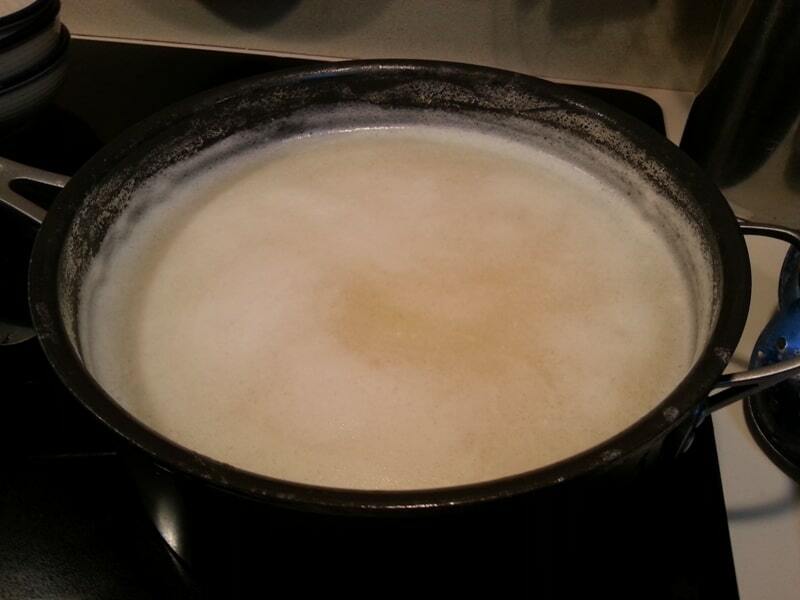 Refrigeration provides an easy way to remove the fat from broths. Then on Sunday before dinner, I brought the broth back to a boil, added orzo and simmered for 9 minutes. My daughter-in-law, Erin and I added the avgolemono. Tempering eggs is so much easier with extra hands. We used an immersion blender for the eggs and for tempering them with the broth. I garnished the magiritsa soup with parsley (instead of the traditional dill). My entire family loved it. Thank you Peter for your easy and modern recipe. I know Yiayia Yeoryia was looking down at us and was pleased. Christos Anesti! 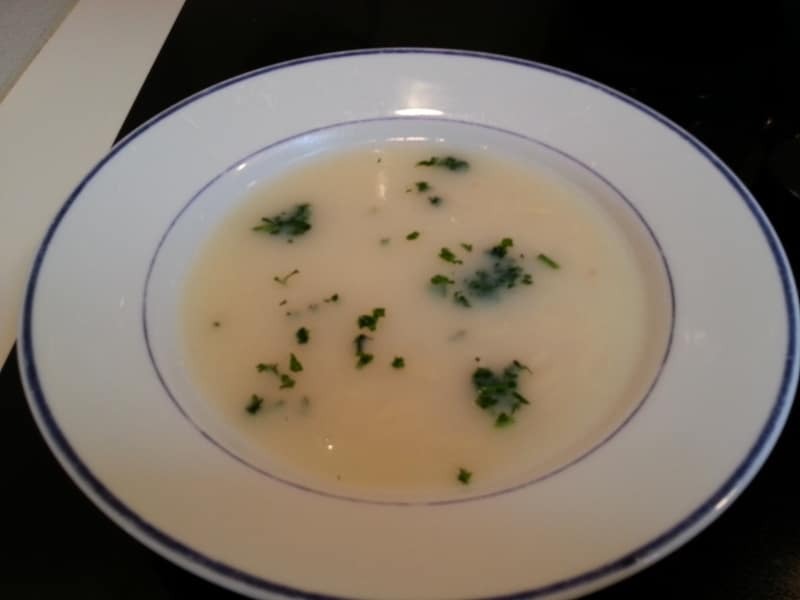 Neo-Magiritsa soup, an updated recipe of a traditional Greek soup by Peter Minaki of Kalofagas. Magiritsa is a traditional Greek soup made for Orthodox Easter. Xpistos Anesti, Kitoula and thank you for making one of my recipes part of your family’s Easter feast. Alethos Anesti Peter! Thank you! I feel as if we are old friends. Yianni and I are hoping to come to Toronto this year and meet you IRL!